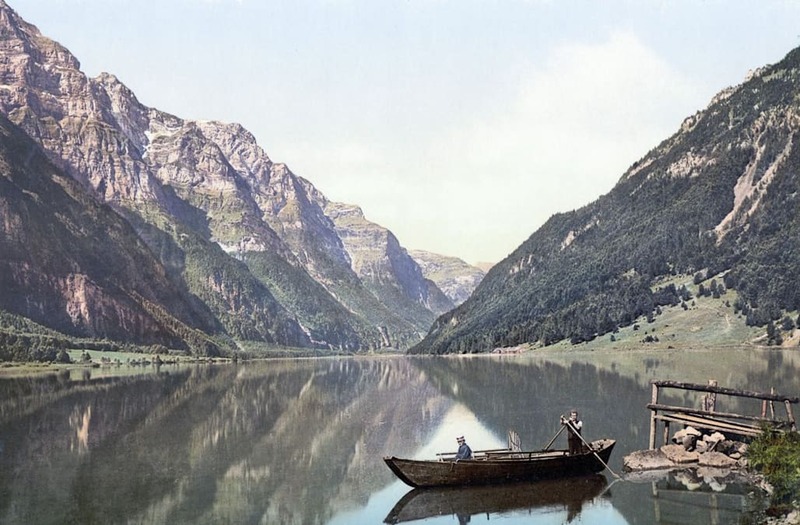 These pictures of the sublime landscapes and stately towns of Switzerland were created using the Photochrom process, a technique for applying color to monochrome images with nuance and precision. Invented in Switzerland by an employee of a printing company, Photochrom was a time-consuming and delicate process. First, a tablet of lithographic limestone would be coated with a light-sensitive emulsion, placed under a photo negative and exposed to sunlight for several hours. The emulsion would then harden in proportion to the tones of the negative. The softer portions would be removed with a solvent, leaving a fixed lithographic image on the stone. Following a photographer's detailed notes on the colors of the original scene, a printer would prepare additional litho stones for each tone to be used in the final color image — often more than a dozen. When the lengthy process was complete, the result was a vibrant color postcard that far outshone traditional hand-colored images. These postcards from the Detroit Publishing Company capture the natural grandeur of Switzerland at a time when true color photography was still in its infancy.